My name is Gwen and I have two sons (Gunnar age 8 and Colton age 5). We live in Mapleton, ND. I have added a few pictures of one of the events Flat Stanley visited while he was with us. 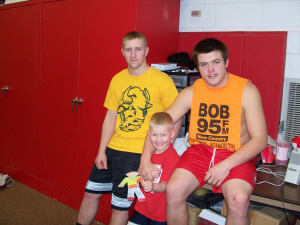 Colton is in a youth wrestling program through the Casselton School system. 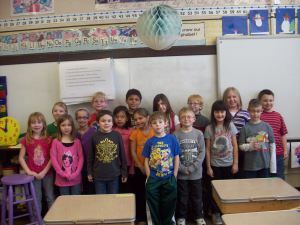 He also visited the Mapleton Elementary 2nd grade class. This is Gunnar’s class. Mrs. Vetter is his teacher at Mapleton Elementary. He is the boy holding Flat Stanley. As you can see, we have lots of snow. Flat Stanley got to play with them outside and he also got to enjoy participating in class. So happy that Flat Stanley came to enjoy the winter in North Dakota!